Hellmann's® Garden Herb Vinaigrette is a rich blend of fresh garden herbs such as basil, oregano and thyme, combined with just the right amount of black pepper make for dynamite flavour. INGREDIENTS: SOYBEAN OIL, WATER, VINEGAR, CORN SYRUP, SALT, HERBS & SPICES, DRIED MINCED GARLIC, GARLIC & ONION POWDER, CONCENTRATED LEMON JUICE, XANTHAN GUM, POTASSIUM SORBATE, DISODIUM GUANYLATE , DISODIUM INOSINATE, PROPYLENE GLYCOL ALGINATE, CALCIUM DISODIUM EDTA, COLOUR. Hellmann's® Garden Herb Vinaigrette is made with fresh garden herbs, is Gluten-Free and has no artificial flavors. The Hellmann's® brand is recognized throughout the world for unrivaled quality and flavor and its commitment to real, simple ingredients, like real garden herbs. 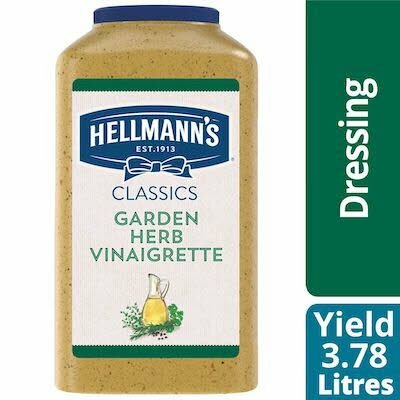 Hellmann's® Garden Herb Vinaigrette is great for green salads, bound salads, as a marinade, on vegetables, as a dip, sandwich sauce and more.